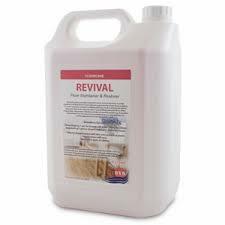 Also for use as a maintenance product for floors previously coated with a metallised floor polish. For damp mopping dilute 1:20 with water. Mop floor with this solution, rinse the dirt into a bucket of clean water and allow to dry. Then machine buff to restore the shine. For spray buffing dilute 1:8 with water. Spray a small amount onto the floor and pass the machine over this area, three or four passes should clean, dry and shine the floor. Do not over apply and do not attempt to spray buff very dirty floors, these should be mopped or scrubbed with a mild solvent-based detergent prior to application of floor maintainer.